And what can you do to prevent Teeth whitening sensitivity? Sensitivity is the single biggest problem with tooth bleaching. It is the most common teeth whitening side effect. It can be very painful, and is a major reason why many patients do not complete the full course of teeth whitening. Even with the best low-sensitivity teeth whitening systems, it is possible for the gel to affect the gum edges, as well as the teeth. Fortunately, the sensitivity doesn't last for long, once you stop the whitening treatment! The whitening gel getting onto the gums. In both dental-office AND take-home teeth whitening, the gel should NOT get onto the gums. The key thing here is to be very careful with the AMOUNT of whitening gel applied. The gel getting onto exposed root surfaces. If your gums have receded a bit, some teeth may have exposed root surfaces, right at the gum edge. These root surfaces can be a bit sensitive anyway, but getting whitening gel on them can really set them off! Bleaching gels that are too acidic. Some tooth whitening gels (the cheaper ones) use acidifiers in the formula to try to keep them stable while in storage. This can result in too many oxygen radicals getting down through the tooth enamel, to the inside of the tooth. The "dehydrating" effect of some gels, which is a result of the chemical formulation. Again, the cheaper whitening gels tend to have more of a dehydrating effect. In addition, gels that cause dehydration of the tooth enamel give a false impression of whiteness. When the enamel re-hydrates again (usually within 30 minutes) the whiteness fades. You can read more about these potential problems at Teeth Whitening Facts. Make sure that whitening gel does not get onto the gums. For HOME teeth whitening, this means applying SMALL amounts of gel inside the splint. MOST PEOPLE APPLY TOO MUCH GEL. For one-hour dental-office whitening, it is up to the dentist to make sure that the gums and exposed root surfaces are protected. IF YOU HAVE ANY PAIN during a one-hour dental-office whitening treatment, TELL THEM! Make sure you are getting a high quality whitening gel with a good formula! The only ones I recommend are from KöR Whitening and WyTen Technology, which are dentist-supplied gels, and the SNOW home whitening system. That's a link to a great deal directly at the SNOW website. These three gels are all safe and effective teeth whitening systems with minimal sensitivity. ﻿Take ibuprofen (Nurofen) one hour before the teeth whitening procedure. A dose of 600mg is best. This has an anti-inflammatory effect, and will substantially reduce sensitivity. But you have to take it ONE HOUR before the whitening procedure, so that it's in your system already. For HOME teeth whitening, limit the gel application to less then an hour. Even better would be 45 minutes. Most of the whitening effect happens in the first 30 to 45 minutes. After that, the whitening slows down. If you start feeling a bit of sensitivity even after 30 minutes, just take the whitening splints out immediately, rinse your teeth with lukewarm water, then brush very gently with a toothpaste for sensitive teeth. 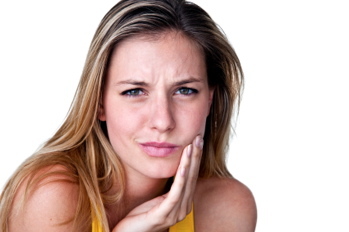 Pain after teeth whitening should not be a problem if you follow this advice! You can read more of my advice at Home Teeth Whitening Tips. Other teeth whitening side effects are limited to the occasional chalky white flecks appearing on the tooth enamel. This is caused by dehydration of the enamel, and it will go away within a day or two. Teeth whitening sensitivity need not be an issue. Just make sure you are getting a quality product, and follow my tips!